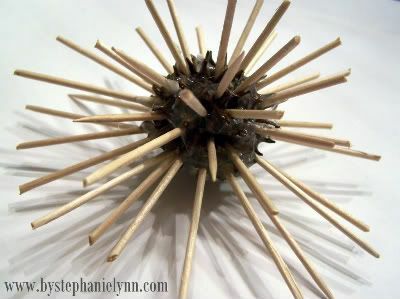 Begin by sticking wooden toothpicks into a sugar gum ball pinecone. They naturally have tiny holes on thier surface making this extremely easy. 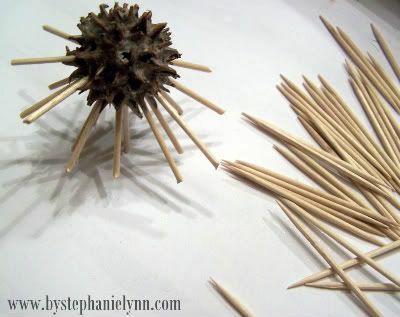 Randomly trim each toothpicks a little to create a starburst pattern. I left the back of the cone mostly flat. Once you have a design you are please with, squeeze a bit of hot glue on the sweet gumball. This will hold the picks in place. 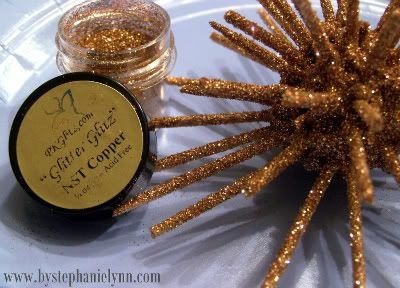 Once the glue is dry, spray the entire ornament with Clear Spray Adhesive and quickly sprinkle PK Glitter Glitz in Copper. The Mirco Glitter works best as it is very fine and can get in all the little cracks an crevasses of the Sugar ball. Shake off the success powder. Cut a piece of floral wire, bend and twist onto the back for the hanger.All of the ornament tutorials featured are very basic and allow you to create them to your own personal taste and style ~ be creative and have fun! Enjoy! Wow Stephanie Lynn! How did you ever come up with that? You’re going to have a gorgeous Christmas tree this yeat! Wow, I am loving your ornaments! I am going to be making several of these! You are making me excited to have the snow fall. You are causing me stress because I realize Christmas is not far away. You are giving me peace as I enjoy each ornament. Very cute, I love the idea! Way to be resourceful! Stephanie Lynn..you’re killing me! I love them all!!! We did these last year-they look sooo amazing on our tree! I don’t know if you saw it, but Crate and Barrel had ones that looked just like the ones we made for almost 10 dollars last year! Crazy! We used bright colors and they look fab! These are darling! I have a million of those pesky little sweet gum balls in my yard and you have inspired me to use them creatively instead of just cussing when I step on them. HA! When my kids were younger and all still at home we made these. Didn’t do the glitter, we sprayed Krylon Gold paint on them. I’m going to have to do it again with the glitter, I can’t believe how gorgeous they are! Very cute! I remember my Mom crafting with Gum Balls…mem-o-ries! 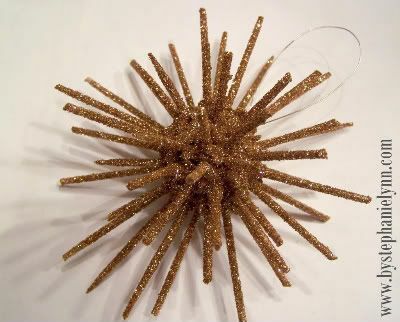 I just got back from Hobby Lobby and I could’nt believe they already had their Christmas ornaments out! I can’t ever walk away without buying a few so today I bought 8…2 of them were $10 a piece! And those are the ones that look just like yours! OMG! My next trip back those babies are getting returned! Oh, cool! These things are all over my neighborhood! Love! I have never heard of a sugar gum pine cone so I will have to see if I can find them. This is such a beautiful ornament. Ok. wow. I have these all over the place – we step on them all the time!! Now I can turn them into something cute instead of something painful. haha. 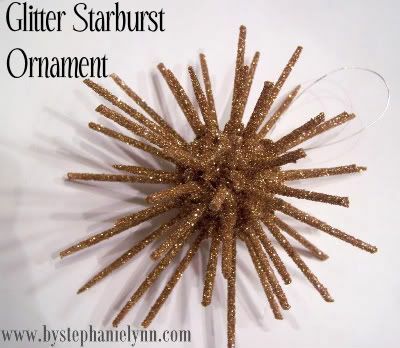 Stephanie — I want to thank you for your wonderful holiday ornament tutorials! I just discovered your blog today and I am so pleased! I live in Pittsburgh, Pa, and I really did not think that anyone else knew what “gumballs” were!! Most people just rake them up and throw them away. My mom and I used to use them in making our pinecone wreaths, but your ornament idea is great! (Love the rolled flower gift toppers and the fabric flower ornament too). I am looking forward to all of your tutorials. Although I have been sewing/crafting and creating all of my life, due to a serious long term illness, I had a major career change from a trial attorney to an owner of a small craft business, but I love it. It is really a challenge. I am both inspired and astounded by the incredible amount of talent that is “out there” – including yours. What a clever idea. Makes me wonder what little sticks from branches would be like. i LOVE your blog.. I am about to make these ornaments to put on my table for Thanksgiving. My husband & I wont be eating here for Thanksgiving, but I don’t see that as any reason as to why I can’t have a beautiful table! I’m also looking forward to doing the “faux rosewood wreath” with the magazine pages.. I have been trying the yarn wreath with felt flowers for a few weeks now, I just can’t get it “right” so this one looks much more fun. Feel free to stop by my blog soon for posts on how my ornaments looked.. I hope they turn out half as great as yours! Great idea!! Thanks for taking time to share this tutorial. Finally, something to do with all of these balls. 🙂 I never thought of this and it’s something my grandkids can do. I am 67 years old and have NEVER heard of a “sugar gumball pinecone” — ?? ?